If you're a fan of sleek, powerful computers and highly-customizable smartphones, then you probably own a Mac and an Android device. But the downside to this glorious hardware pairing is that it can be hard to get the software on the two devices to play nice together. Previously, the best way to transfer files from an Android phone to a MacBook or an iMac was to use Google's Android File Transfer app for OS X. But this app has a bare-bones interface, and it's extremely lacking in features. Well, the development team at Smartisan Technology has the perfect Android File Transfer alternative. Their Mac app sports a beautiful, native interface, while giving you the ability to drag and drop files from your phone to your computer, as well as perform batch import and export operations, so I'll show you how to set it up below. 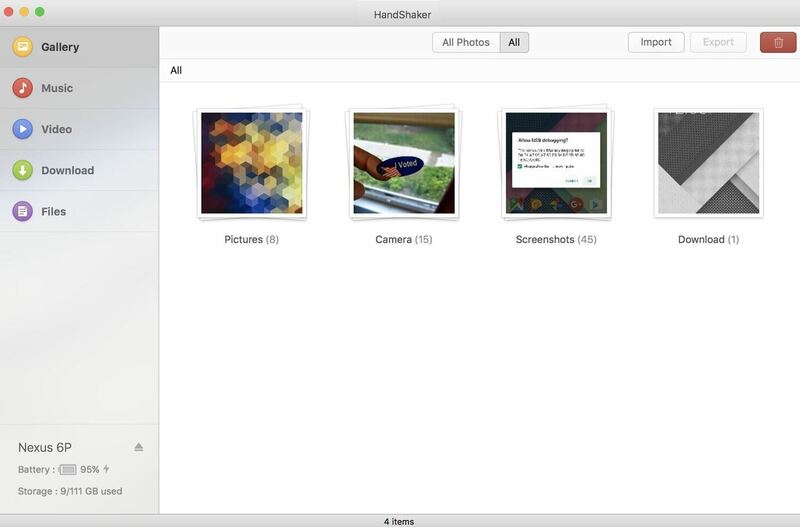 To get started, the first thing you'll need to do is install the Mac app, which is called HandShaker (previously named SmartFinder). We recommend uninstalling the old Android File Transfer app at this time to avoid any conflicts. 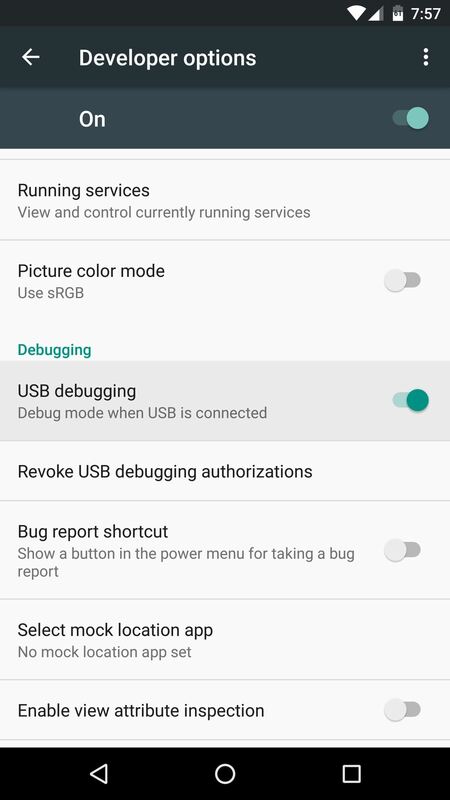 Next, you'll see a screen prompting you to enable USB debugging on your Android device. 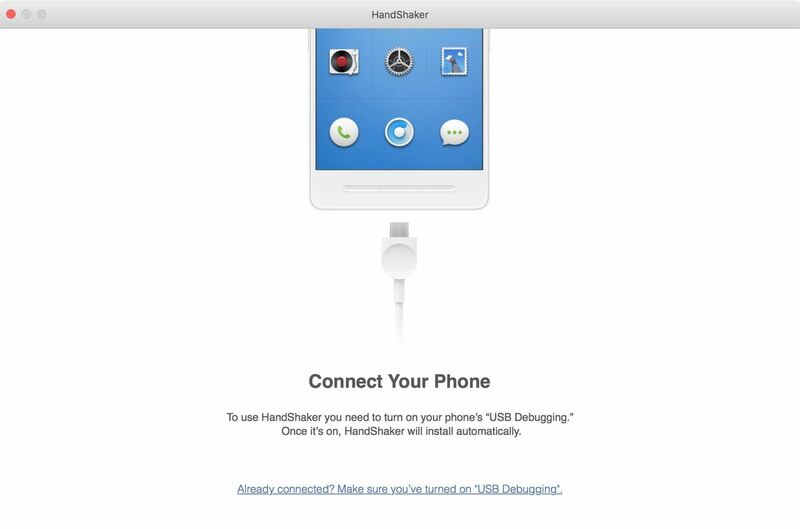 Leave HandShaker on this screen, then grab your Android phone or tablet to do a bit of setup. Over on your Android device now, you'll have to start by unlocking the "Developer options" menu if you haven't done so in the past. With that taken care of, open your Settings menu, then scroll down to the bottom and head to the "Developer options" entry. From here, enable the switch next to "USB debugging," then press "OK" on the popup. At this point, go ahead and connect your phone to your Mac with a USB data cable. Make sure that the HandShaker window is still open from Step 1. 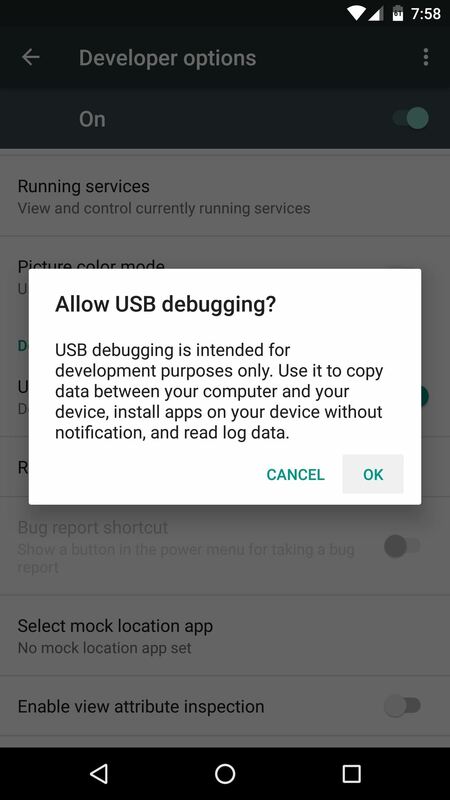 Once you connect the USB cable, you'll see a message on your Android device asking if you'd like to allow access from this computer. Tick the box next to "Always allow" here, then press "OK" on the popup. With everything set up now, give HandShaker a moment to finalize initial setup, and make sure to leave your phone connected to the computer. At this point, you should be greeted by HandShaker's main menu. It's an intuitive interface, complete with thumbnails for all of the pictures that are stored on your phone. If you'd rather see different types of media, you can use the navigation menu on the left to browse by Music or Video as well, and the interface in these menus looks just as nice. When you head to the Download or Files section, though, the interface starts to look more like a traditional Finder window on Mac. And within all sections in HandShaker, you can drag and drop files from this window directly onto your desktop or another folder. 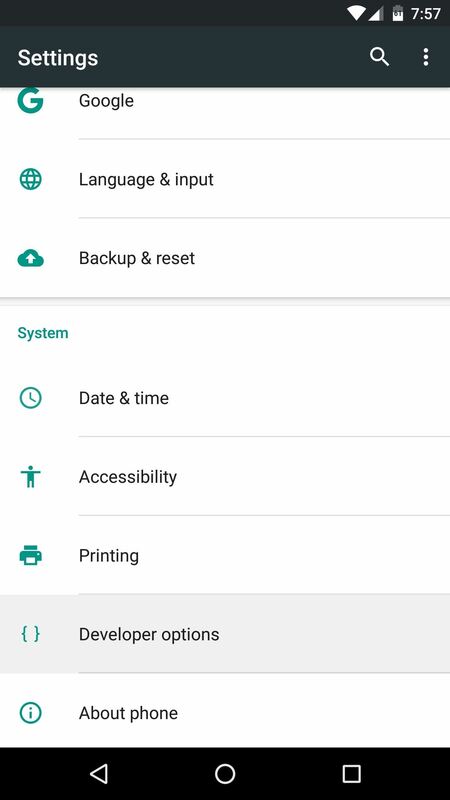 But perhaps the most interesting feature here is the "Import" and "Export" button at the top of the screen, which lets you easily move batches of files between your phone and your computer. 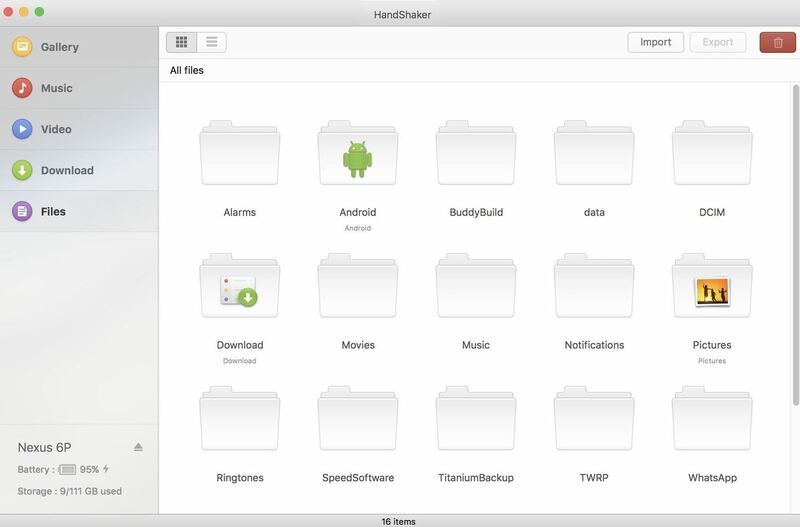 Overall, it's a great alternative to Android File Transfer, to the point where HandShaker is better in almost every way. Anything that requires USB debugging is something to be concerned about. USB debugging is for development purposes. Are. You. Effing. Kidding. Me? This app lasted all of 5 minutes on my computer/phone, and I was gladly reinstalling AFT. It may be useful for moving files from an Android device to the Mac, but going the other way around? AFT is more powerful. I want you to think about that for a second: a v1.0 app that hasn't been updated since 2012 is still superior to an app that was in v2.0.2 in late December 2016. Go ahead. Take your time. Let that sink in. In the "Music" section of the app, you can't delete music folders, nor can you drag them from the Finder to the app. If you do, you get an error message: "Cannot found (sic) audio files in transfer path." You have to do that instead in the "Files" section. A pretty interface is worthless if the functionality and UX is useless. Total crap. There's also no mention here that your phone (or at least some, like the S8) will need a helper app in order to connect... which may or may not be downloadable via their poorly connected, 3rd party source for sideloading (which is almost always a bad idea from a security point of view.) It is also worth mentioning that this 3rd party source is also, unsurprisingly, in our firewall appliance's blacklist for multiple malicious flags. And last but not least, this macos app only has 28 reviews, 16 of which are 1 to 2 stars. And in my opinion, the 5 star ratings read very much like paid reviews. Thanks but no thanks... I'll stick with what works. Step 1: Delete this WRONG artcle & make up mind: either Gadgehtacks or Wonderhow? It seems not only the so highly praised 'Smartisan' app HandShaker is useless, with apparently not having one happy user ( I luckily read the comments and then decided NOT to try it). I am further of the opinion that the author Mr Dallas Thomas should realise that the app is crap (based on user experience) and either rewrite his article and point to something better, or then simply delete it. Leaving this 'BAD advice online is definitely a pain for many people (like me). But it seems the entire site (gadgethacks.com) is rather weird! Why? When singing up to write this comment, you receive an email from a totally different domain (wonderhowto.com) w/o any remarks that Gadgethacks and the 'Wonder..' belong together!! ?!? !